Sunday October 9th 1892 I helped through with the morning work and went over to Woolfs for a little while to see Jennie. She had been quite sick. Soon as we had dinner Will hitched to the surry and we drove down to Jim Stevens taking Hatt and Edith with us. I helped through with the supper and read and wrote in the evening. Ott, Fanny & Annabel were here a short time. Monday October 10th 1892 We washed churned and done the other work this morning including the getting of the dinner. In the afternoon Mother and I rode to the west farm and then on over to Lucas before comeing home. I helped do up the evening work. Tuesday October 11th 1892 We got around with the work in good time this morning and about ten oclock I drove over for Mrs Susan Smith to come and visit us. Hattie & Mrs Home was over in the afternoon. I helped do some ironing and baked cake after dinner. Wednesday October 12th 1892 I was busy with the house-work all forenoon. Soon after dinner Mrs Smith and I went over to Mary Woolfs and then I took her home. I stopped in town to do the marketing on my way home. 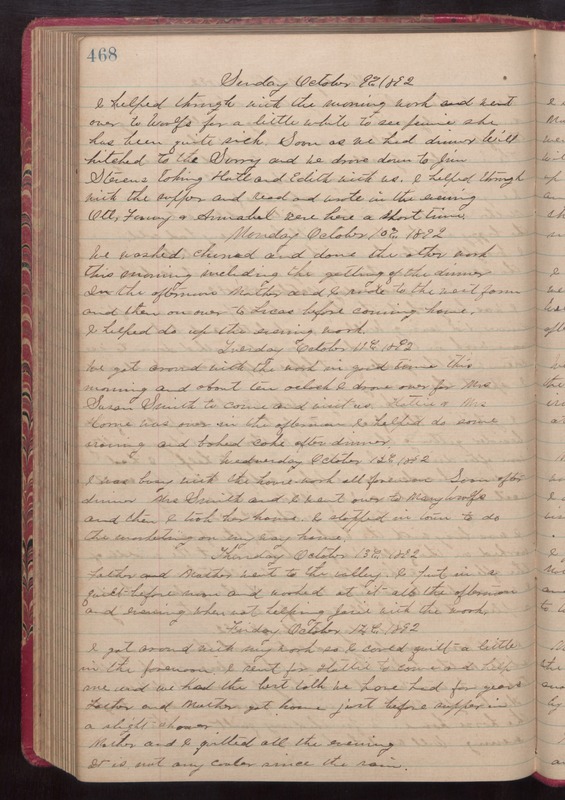 Thursday October 13th 1892 Father and Mother went to the valley. I put in a quilt before noon and worked at it all the afternoon and evening when not helping Josie with the work. Friday October 14th 1892 I got around with my work so I could quilt a little in the forenoon. I sent for Hattie to come and help me and we had the best talk we have had for years. Father and Mother got home just before supper in a slight shower. Mother and I quilted all the evening. It is not any cooler since the rain.